Grace means Jesus did it all so we need to do nothing?? Introduction: To begin let us clarify something. The statement “We need to do nothing because Christ has done it all” is erroneous when used as a general statement without giving it context. As pertaining our salvation Jesus has indeed done it all but as pertaining a life of sanctification there is a lot we must do. The New Testament is full of instructions of what we should and should not do. If we were to remove all such chapters the New Testament would be reduced to nothing more that a pamphlet. The price for our salvation was too high for us to pay. 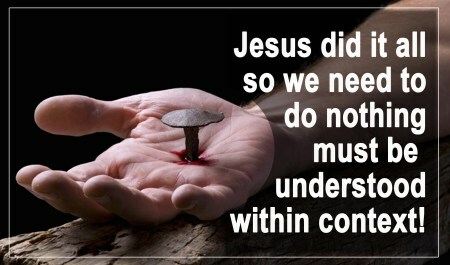 There was no way possible we could fulfill the requirements, so God came down in flesh and paid it for us. The lamb for the sacrifice needed to be spotless and there was never or could ever be a spotless man but Jesus, God in flesh, was spotless so He gave Himself as the sacrifice. Jesus paid the price. Since the job of securing our salvation is finished we need now only to repent and accept God’s finished work. NOTE: The subject of this sentence is our salvation. Paul is describing how we are SAVED. He is not trying to clarify our faith or even God’s grace. He is clarifying how we are saved so when he continues “and that not of yourselves…” he is not speaking of the faith (though our faith does come from God) or even the grace but our salvation. This follows through the rest of the sentence, salvation is not of ourselves, salvation is the gift of God, salvation is not of works… This is also consistent with the rest of scripture. BIG NOTE: Paul in this passage is not saying we should never do works but that our salvation is not based on them. Paul had to tell us that works doesn’t save because people were rejecting God’s means of salvation (Jesus Christ) and putting their trust in a points system (Romans 10:3-4). They thought they could score points through obedience to the law and be saved by that. Works must be divided into two categories as stated in scriptures. Is points based or performance based as if our salvation depends on our ability to keep the law. Is hard work because it is dutiful and does not flow from the heart or is empowered by the Spirit. Lacks joy because it is self sacrifice that carries no reward. Makes us proud when we accumulate a lot of points. Devastates us when we discover we cannot keep it up. This was the very reason God implemented it. That through it we should discover our weakness and be devastated and broken enough to realise and call upon Christ our only hope of salvation. Creates hypocrites out of those who makes this discovery but turn their backs on it to retain power and status because they love the points system that makes them out to be better than others. Brings us into rest because it does not involve dutiful work but what we do flows from a heart of love and an ability that is empowered by the Holy Spirit (Hebrews 4:3). Has joy unspeakable and full of glory because we know that Christ’s sacrifice was sufficient and our salvation is not based on our own pitiful performance. Is done with great humility knowing that we cannot take credit for anything we have or do because we have nothing that God has not given to us or can do nothing that God hasn’t empowered us to do (John 15:5). Can be extremely powerful because it relies on God and not on human ability (John 6:28-29). The saying is true, ‘a little knowledge is dangerous’. To teach that, to be saved and when we are saved, we need to do nothing because of grace is dangerous and will shipwreck the faith of many. We are not saved by works i.e. seeking to be made righteous before God on our own performance rather than on Jesus’ sacrifice. We are not saved by works that reject Jesus, God’s sacrifice for sin. We know we are saved, by/because of our works i.e. what we do confirms or disqualifies our claims of salvation. We cannot come into the grace of God and experience the power of God’s salvation through Christ and do nothing. It is impossible. Paul’s statement in Ephesians 2 continues “For we are His workmanship, created in Christ Jesus for good works…” We are appointed to work. So, with the above clarification in mind, let us stop panicking when Scriptures instruct us to do. Obeying Scripture by doing what it says is not trying to be saved by works. The commandments of God are not grievous and not even difficult, because we are helped by the Spirit of God, but they must be done, and to do them requires effort. Jesus did not do away with the law so we need to still keep it?? This scripture is misunderstood by a lot of people. Some believe the fact that the law is not abolished means that we should still be exercised in the meticulous job of observing and keeping them i.e. our focus should be fixed on what the laws are and how well our performance is keeping up with their requirements. So, what did Jesus NOT come to do? He did not come to abolish them. Abolish: “Formally put an end to (a system, practice, or institution)” Oxford Dict. There are two ways to get out of a debt. 1. The person to whom it is owed dies or 2. Pay it. In the above Matthew scripture Jesus is saying He did not come to do 1. but 2. Jesus paid our debt so the law that demand payment is satisfied. Why are we still running after it and throwing worthless coins at it. Did Jesus only pay part of the debt? Note: anyone who will not accept Jesus’ offer to pay off their debt will have to find a way to pay it themselves, which is impossible, yet many still want to at least give it a try. The law hasn’t changed but our approach to it has, under the New Covenant we no more observe it by the letter but fulfill it by accepting Jesus’ payment on our behalf. Based on 2 Corinthians 3:7-9 the reading of the law condemn Jews who will not accept Jesus’ work on the cross because it shows up their impotence and inability to save themselves through their meticulous observation of it. On the contrary those of us who are in Christ fulfill these laws naturally without having to dutifully count and tick each box as we punish ourselves to obey each one. Galatians 5:14“For all the law is fulfilled in one word, even in this: ‘You shall love your neighbor as yourself.’” For us the commandments of God are not grievous but to those outside of Christ it is. Jesus in His ministry brought out what God was truly after when He gave the commandments i.e. a heart of love and obedience, not outward dutiful conformity. This is why He explained that fornication etc. is committed in the heart. Again He taught that we must clean the inside of the cup and the outside will be clean also i.e. the more excellent way is to live from the inside out. To us who are in Christ the law is a mirror to help us clearly see where we have messed up so we can go to our Father and get washed. In the following scripture we will discover two types of righteousness, the former is rejected by God but the later accepted by Him and is based on the New Covenant. Therefore, those of us who are in Christ should not return to what I call ‘tick box’ observation of Moses’ law (Paul calls it legalistic righteousness). On the contrary, we must keep our eyes fixed on Christ, love Him, have faith in Him and obey Him for in Him we are free from the the law (our debtor). Through faith in Christ we are declared righteous but no one will be declared righteous by observing the law. So remember, just continue to love and trust Him for a person who depends on rules does not have faith in Christ and a person who has faith in Christ will not depend on their ability to keep rules. The two cannot co-exist. A person who tries to keep the law is rejecting Christ, even if this person is a Christian. They are falling from Grace. Note: that the law hasn’t changed but its location has. It’s no more written on cold stones but on warm hearts. “I will put My laws in their mind and write them on their hearts…” Hebrew 8:10 This is speaking of the 10 commandments that were written by God, not the 603 that were written by Moses. We naturally desire to do what the law requires because it’s in our hearts. It is faith that pleases God and not dutiful performance therefore, have faith in Jesus and receive His Spirit from whom the righteous requirements of God will flow naturally. The law tells those outside of Christ what they MUST DO to obtain righteousness as required by God. The hope is that they would discover that flesh cannot fulfill the righteous demands of the law. On the other hand, the law points those who are in Christ to what they WILL DO when they have obtained the righteousness which is by faith. When we look into the mirror of the law we see where we have messed up so we can go to our Father and get washed. When those who will not accept Jesus look into the law they see hopelessness and condemnation.